Americans spend an average of 5.4 hours a day staring at phones, tablets and computers – and Millennials are the most preoccupied with their mobile devices. People age 23-38 average 5.7 hours of screen time a day, compared to 5 hours a day spent by Baby Boomers, according to a survey of 2,000 people in both age groups by Provision Living, a chain of assisted living facilities. 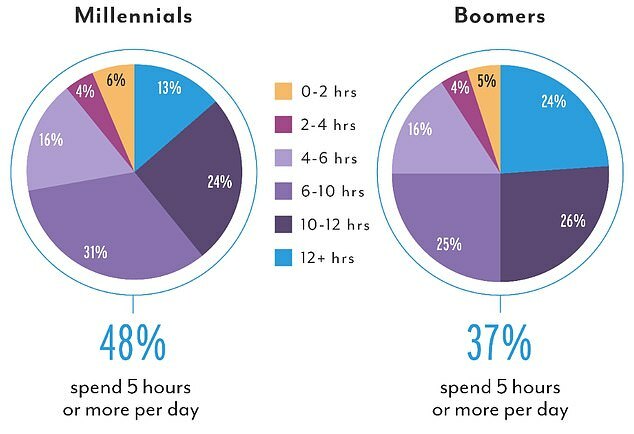 Both generations spend the most time on Facebook and Instagram, with Baby Boomers averaging 60 minutes a day on the former and 44 minutes a day on the latter. By comparison, Millennials spend an average of 69 minutes a day on Facebook and 52 minutes on Instagram. In addition to asking survey questions, researchers had each participant record the actual time spent on each of their devices, along with which applications they used most heavily. 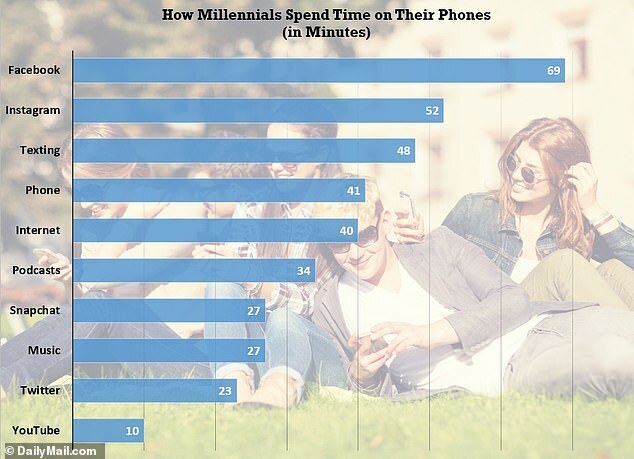 That’s where the generational differences emerged: Millennials actually spend more time texting (48 minutes) and talking (41 minutes) on their phones than their older counterparts (30 minutes and 24 minutes, respectively). Millennials are also more likely to stream music services on their phone, such as Spotify or Pandora (27 minutes). 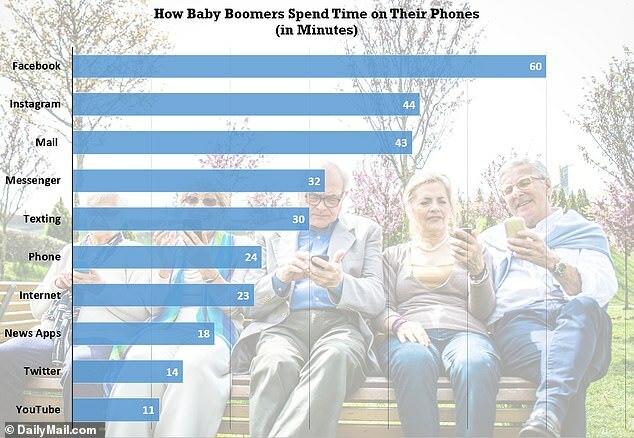 Meanwhile, Baby Boomers spend more time on email (43 minutes a day) and Facebook Messenger (32 minutes). Millennials and Baby Boomers spend the least amount of time on Twitter and YouTube, averaging less than 34 minutes collectively on those apps across both generations. Millennials also spend more time on podcasts (34 minutes) and Snapchat (27 minutes), while Baby Boomers average 18 minutes a day on news apps. One-third of survey respondents told researchers that they spent more time staring at screens than they expected – but most don’t seem to mind. Two-thirds of respondents said they wouldn’t use their phone any less after learning the reality of their habits, even though 94 percent believe that smartphone addiction is real. A majority of Americans (60 percent) said they use their phone as their primary entry point to the internet – above traditional computers. In addition, 90 percent said they go to sleep with their phone within arm’s reach.